Can anyone help me to identify this strange part? 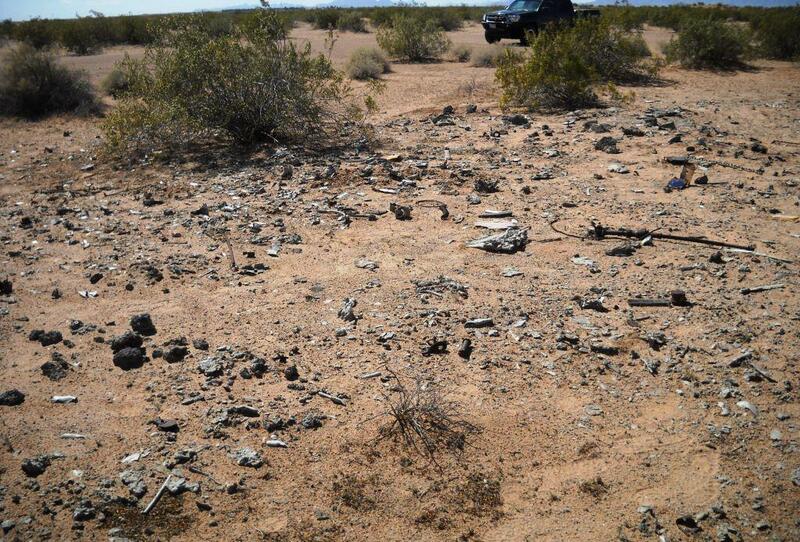 It is at a Boeing YB-40 crash site near Dateland, Arizona. I have heard that before, but the thing that confuses me is the blue disc? 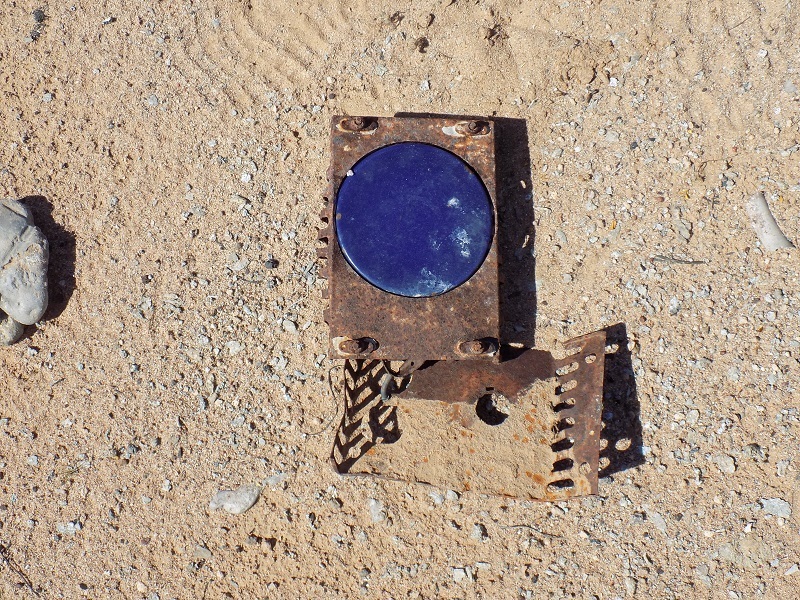 The blue disc is made of ceramic, an insulator. I looked through some of my photos and found about ten of those heater controllers from a few different sites, all are only of the front view of the units. I don't remember ever seeing that bight color on any of them. Never heard of a YB-40 before, had to look it up. Kind of interesting, but from what I read on them the idea didn't work out very well. The dual waist guns look cool. I suspected (correctly) but I also had to look up to see that a YB-40 was a B-17 gunship. Yeah, lots of guns, and like triple the amount of .50 cal ammo to feed all of those guns. YB-40 turned out to have a serious flaw. It was heavy and didn't lose weight as the bombers did after dropping their payload. On the turn away from the target and return to base the YB-40 couldn't keep up with the formations it was meant to protect. Now about this YB-40 crash site... Dennis You should join us sometime for sites like these. 1. Airplane number 42-5743 was on a routine scheduled gunnery training flight. Shortly after takeoff and after reaching an altitude of approximately 6500 feet, the number two engine started smoking and the oil pressure dropped. Upon noting this, pilot feathered number two engine and started to return to Yuma to land. After flying approximately ten minutes, the number one engine began detonating and running very rough. The pilot then feathered the number one engine and started to go to Dateland AAF to land. The airplane was maneuvered for straight-in approach and due to the decreased amount of drag with two engines feathered, the pilot overshot the field and attempted to go around on the number three and number four engines. 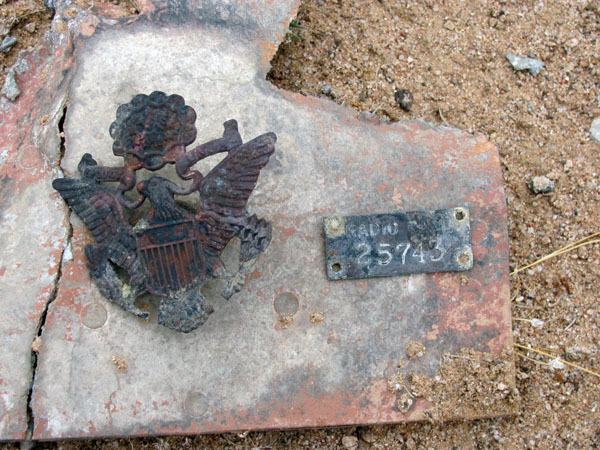 After completing approximately a 180 degree turn, number three engines started losing power and the pilot was forced to crash land in the desert resulting in damages as listed on attached Tech Inspector's report. 2. Statement of responsibility: 75% Material Failure, 25% Pilot Error. 3. Recommendation for Action to Prevent Repetition: All pilots have been cautioned and stress has been placed on the decrease in the amount of drag created by one or more feathered engines in the execution of a landing. Aircraft served in 92nd Bombardment Group (Heavy) Historical Campaign. A list of YB-40 Missions from May 29, 1943 until July 29 1943 is detailed below. The Dateland YB-40 is a great site. About 20 years ago I tracked down the pilot, Lt. Wendell Dusharme, and gave him a call. His wife answered and was very abrupt and asked what I wanted....as soon as I told her about my research of his crash she instantly changed and became a very sweet lady. She explained that he had just died 2 weeks before and thought I may have been trying to somehow pull a scam. We had a great call and she said he would have really enjoyed talking about it. After a long conversation we hung up and I never thought I would have heard from her again. Two weeks later, I received a large envelope in the mail and it contained 6 original USAAF photos of the YB-40 crash as well as other photos of Wendell overseas flying B-29's. I received Christmas cards from her every year until she passed away a while back. 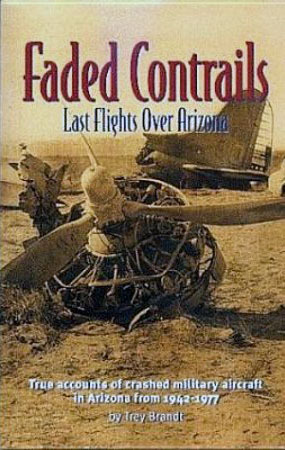 The YB-40 is the crash on the cover of my book, Faded Contrails.